Trash: Worms produce their body weight in waste every 24 hours. 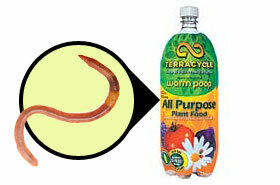 Salvage: Terracycle converts organic garbage destined for landfills into environmentally friendly liquid plant food (from worm poop). Cash: Terracycle is now sold in Wal-Mart, Home Depot, and Whole Foods, and expects to generate $15 million in revenue in 2009. 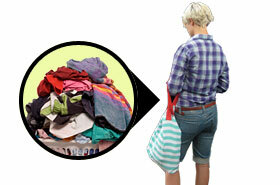 Trash: Americans throw away 21 billion pounds of clothing and fabrics each year. Salvage: Some 2.5 billion pounds of those clothes end up in resale shops such as Savers, the largest private vintage emporium, with 210 stores. Cash: The industry reported a 35% sales boost in 2008. Vintage is trendy too: Supermodel Agyness Deyn is known for her “proper mad” outfits. Trash: More than 290 million tires are scrapped each year in the United States. Salvage: Diamond Safety Concepts buys finely ground used tires and then makes and sells playground covers and athletic fields. Cash: Crumb rubber sells for $700 per ton, and Diamond Safety Concepts experienced a 20% sales bump in 2008. Trash: During the usual chip-making process, some bits of the spud are discarded due to size. 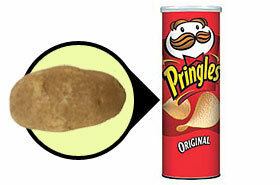 Salvage: Procter & Gamble’s Pringles convert the whole tater into dehydrated potato flakes to form a dough that’s rolled and cut into chips. Cash: Pringles is a billion-dollar-plus brand that saw double-digit sales growth in the third quarter of 2008.